When the weather is grey and gloomy, the deep red of this faintly scented flower from January to February is a welcome change. The calyx of each flower is a purple/red creating real depth of colour - in our view, the best of the red Witch Hazels. The large, green foliage turns fiery shades of red, orange and yellow in autumn. 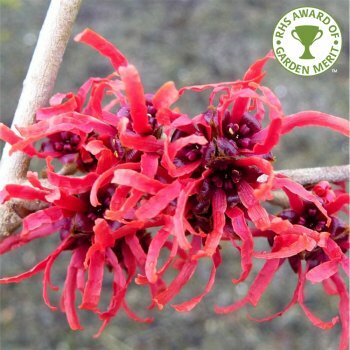 The distinctive vase shaped, spreading structure of Red Witch Hazel makes it beautiful even when bare. Hamamelis are also of great value to wildlife. Named after his daughter by plant breeder, Robert de Belder (who also named Hamamelis Jelena after his wife). Expect a height and spread of 4 x 4 metres in 20 years when given a well drained, acid - neutral soil in sun or partial shade. This wonderful shrub will tolerate some exposure. Our pot grown Red Witch Hazel shrubs can be planted at any time of the year. Start by removing all weeds and grass within a metre of your intended planting hole. Dig a square hole as deep as your root mass and approximately 2x as wide. To help your shrub establish more effectively, especially if you have poor soil, we advise sprinkling root grow in the hole. If you're planting Red Witch Hazel in spring or summer, water well and regularly for the first few months. Increase watering if there are extended periods of hot or dry weather but if you're planting in autumn, you may only need to water a little. We stock a range of irrigation kits, suitable for a variety of planting schemes. Red Witch Hazel shrubs do not require regular pruning. If you wish to tidy up your witch hazel shrub, do this during the dormant season. Focus on removing any damaged, diseased or overcrowded branches.